While doing research on many topics in Jamaica's history in the period between 1865 and 1944, I frequently come across considerable amounts of information about Jamaicans who never hit the headlines, who were . . . just ordinary Jamaicans. However it is sometimes possible to put together enough information to get a good picture of these men and women and how they lived their lives, which were not, in fact, - 'just ordinary'. 'In fact', there are many truly 'extraordinary' Jamaicans whose lives, and contributions to Jamaica's history, can be retrieved in this fashion. On these pages a few of these people will be introduced. 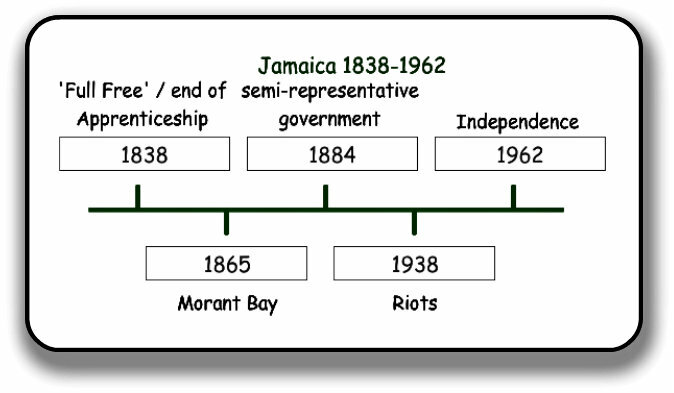 I am particularly interested in what I think of as 'Generation 1900' - Jamaicans alive in 1900 were just half way between two significant dates in Jamaica's history - 1838, marking the final ending of slavery, and 1962, the beginning of Jamaica's story as an independent nation.